Hmmm, apparently this is the week of double shot reviews, though technically I do have an excuse for this one too. New Orleans Ice Cream company was nice enough to send over a nice selection of pints for me to try, but apparently this next pint unfroze at some point. I hate to waste, so we're still going to run through it anyway. 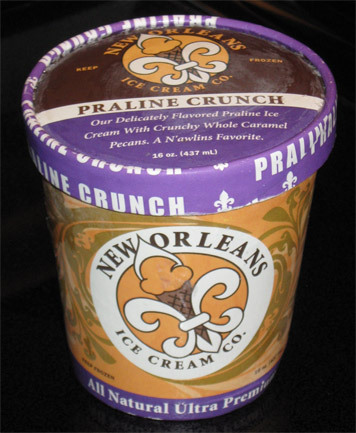 This is New Orleans Praline Crunch. Now the standard company would throw something out like "praline pecans in vanilla ice cream", maybe throw in some caramel, and be done with it... but not these guys. 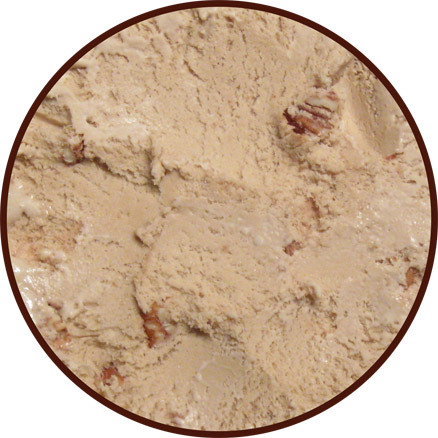 "Our delicately flavored praline ice cream with crunchy whole caramel pecans. A N'awlins Favorite". Read that again -- the base is praline flavored and the pecans are caramel flavored. That's just silly. Wow, that catches the eye doesn't it? What a rich unique color and look at all the pecans! And when I say pecans, I mean tons and tons of pecans. They are whole, they are soft, and they are everywhere. Now the sad news is that this pint is crazy icy. I don't know what happened, but I'm thinking I probably shouldn't be eating this one. You can tell when a pint's consistancy is changed by the mix-ins, and then there's just a bum pint. It's a shame too because this one is made outside the box like so many New Orleans flavors. The somewhat mild praline flavoring of the base is just something you never really see. I know it didnt, but it seemed like a got a few pecans on every spoonful.... though maybe I was aiming for them, maybe it just seems that way since they are full size and not just chunks. Bummer, I think I probably would have enjoyed this pint... Oh, I also think the caramel flavor got lost in the icy depths of this pint. I scooped all the way to the bottom but I just couldn't find a spot that tasted normal (there may have been one bite that was almost normal). 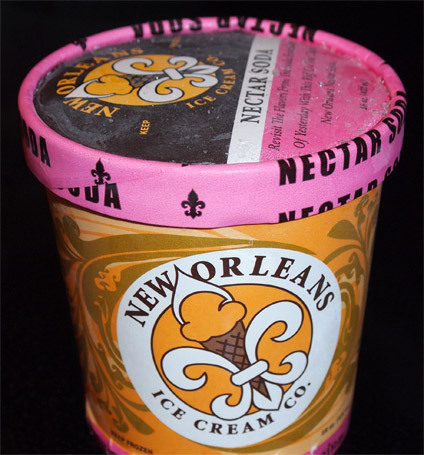 2013 Update: The fine folks of New Orleans ice cream company sent over not one but two replacement pints of this flavor. The good news is the texture is way better. It's crazy how many sugary pecans are in every spoonful. I swear I must have had a couple dozen in my first sampling. I do love me a sugary crunch. I still don't really notice the caramel on the pecans but I never do when it comes to subtle caramel flavors. I'm not sure the praline base is something I would go running back for, but if it's your thing, you should definitely try it here. --- Funny, I totally have a brown sugar aftertaste going on right now. Fearing that my other two pints were also damaged, I decided to scoop into one the next night (with my fingers crossed). I feel really bad when companies invest in sending me samples and they get damaged. This is New Orleans Nectar Soda and thankfully, it's just fine... though I have no idea what I am getting in to here. "Revisit the flavors from the soda fountains of yesterday with this riff on the classic New Orleans Nectar Soda". HAHAHAHA, the pint coloring matches the the ice cream! That's too funny, but I like it, that's cool, now I really don't know what to expect --- but it does smell oddly familiar. I take a few bites and the nectar soda flavor is really hard to place. I want to say cherry, but it's not cherry, it's more woodsy (tree flavored) than that. It's time like these that I wish my pallet was more sophisticated... but it's not, so that means it's Google time! reading.... reading.... Vanilla with hints of almond? wait, what? 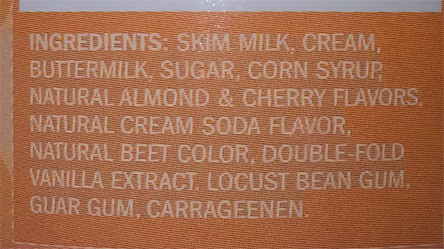 Let me check the ingredients. Well, there ya have it, almond flavor and vanilla extract! Google wasn't lying. 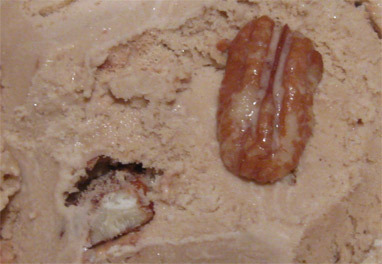 You know, I'm starting to think the New Orleans ice cream company has an affinity for nuts. Not that I have a problem with that, it's just weird for me because I spend so much time avoiding nuts yet I don't always remember to look for it in ice cream. For example, this is like the moose tracks fudge. I expect peanut butter in the peanut butter cups, but I don't expect peanut oil in the fudge swirl. As I snack away, I am grateful that the soft texture of the other New Orleans flavors is back. The flavor is definitely different, in fact, it almost tastes like they put carbonation in here. I check with my wife and she is thinking the same thing (maybe that's the cream soda flavor popping through?). The strange thing here is that the flavor is oddly familiar, but I can't put my finger on it. I do have one thought. Now I don't really like chunks in cherry garcia, but here they might work. Right now I can't envision having more than a small serving of this flavor, but I think the base might blend perfectly with the bite of some dark chocolate chunks right now. Maybe anyway. -is this one different? Yes. -Is this one for me? I don't know. 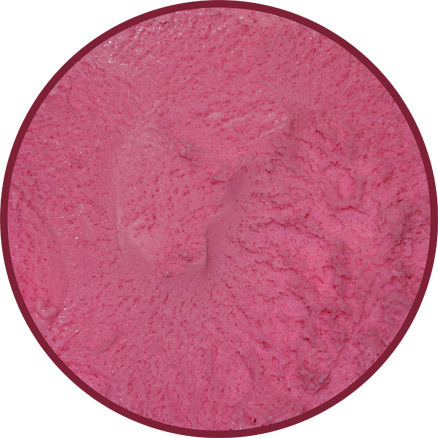 Part of me digs the easy scooping and the bite, but I wish it was rocking more cherry and less almond. -Is there still hope for this one? Yes. I can't help but think that fairly potent flavor is telling me to mix it with something that will balance it out. I haven't figured out what yet, but definitely something. hehehehe, found something to put on top! 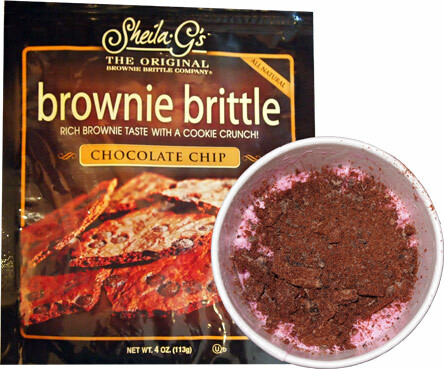 If you ever happen to see Sheila G's brownie brittle, definitely give it a try - well, if you love crunchy brownie edges like I do. What a nice treat, and it went great in the ice cream.